Soooo… I’m not sure if this is true, but I feel like every time I hang out with the nephew (5) and the niece (2) I catch something. Even if they’re not sick! Cos kids are disease vectors! Yut says it’s just me, cos he never gets sick, the punk. Anyways, so yeah, I’m sick. It’s just a cold, thank goodness (I guess). Mostly snot and cough with some sore throat — so basically all the most disgusting icky symptoms only. And I know I’m extra icky cos on Tuesday, after helping someone clean up a virus (the irony!) off of their computer, the guy said thanks and shook my colleague’s hand but refrained from shaking mine! Well I had my arms crossed cos I didn’t want to shake his hand cos I was grossing myself out, but now you know how groady I was. I stayed home yesterday and had chicken noodle soup for lunch. well isn’t part of the reason you’re sick cuz your body’s super dehydrated?… and yet,super saltly pho and chicken noodle soup makes you feel better how?… lol its all good. when im sick i like to turn to a good ol bowl of pho. not so much the chicken noodle soup. 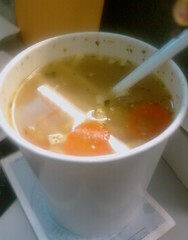 its been a while since ive been able to find a chicken noodle soup that isnt overly saltly with nice chewy noodles.